A close friend just had her 3rd baby and I had the honor of hosting her "Sip 'n See" with three other friends. 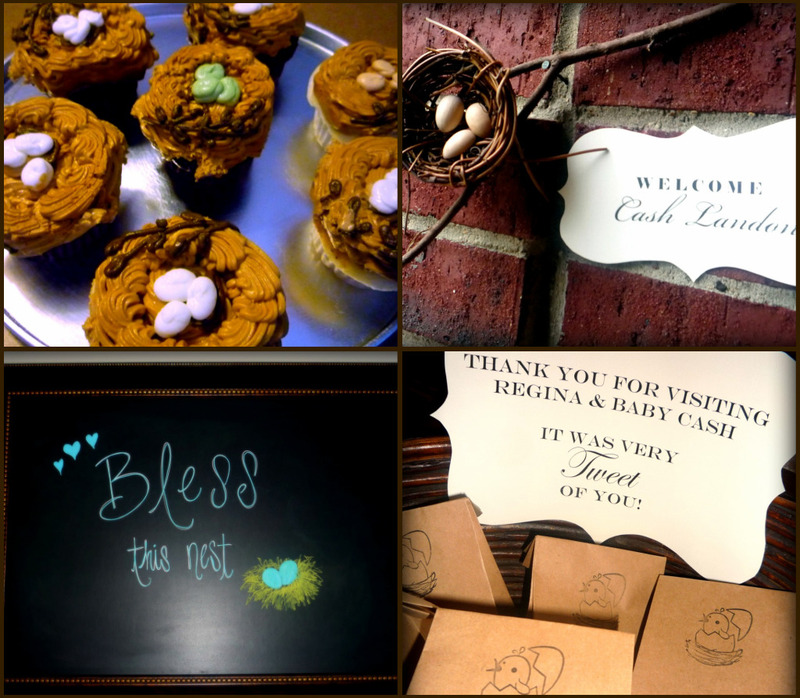 We knew we wanted to do something different this time, since she has already had two typically-themed baby showers -one when she was pregnant with her first son and one before her daughter was born, which I also hosted. 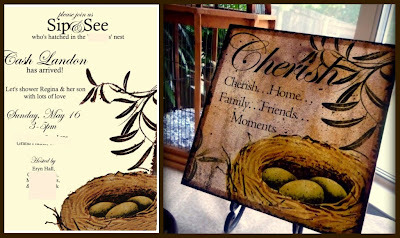 When we saw this Cherish art we were inspried! Bless Her Nest! 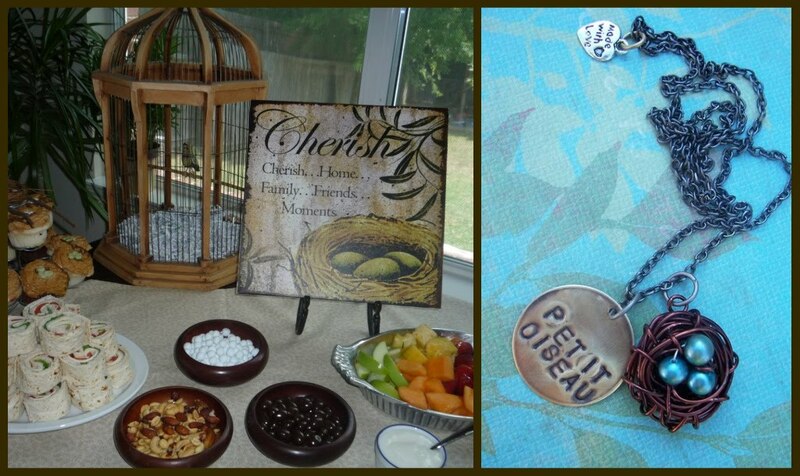 The earth tones, the 3 eggs in the nest, and the "Cherish" message was perfect for our friend, and we especially liked that it wasn't particularly baby-ish. It was a beautiful Sip 'n See and the unique theme made it extra fun! I designed the invitations to coordinate with the artwork inspiration. The cupcakes turned out beautiful- they look just like little nests, each with 3 eggs. I made little nests (with 3 eggs of course) on branches to tuck around the decor...this one greeted guests as they entered the front door with a welcome sign. My dining room chalkboard message read "Bless this nest." And guests took home "tweet" bags filled with Junior Mints. The hostesses did a fantastic job setting the scene with food and decor. It was very easy to pull in little bird figurines and decorative birdcages that we already had in our own homes. The new Mama got to take home the "Cherish" artwork as well as this custom necklace from Emilina Ballerina, the one we got was stamped with "BLESSED." It's Thursday, and I loved the "Bless Her Nest" Baby Shower theme! For more Things I Love Thursday head on over to TheDiaperDiaries.net.